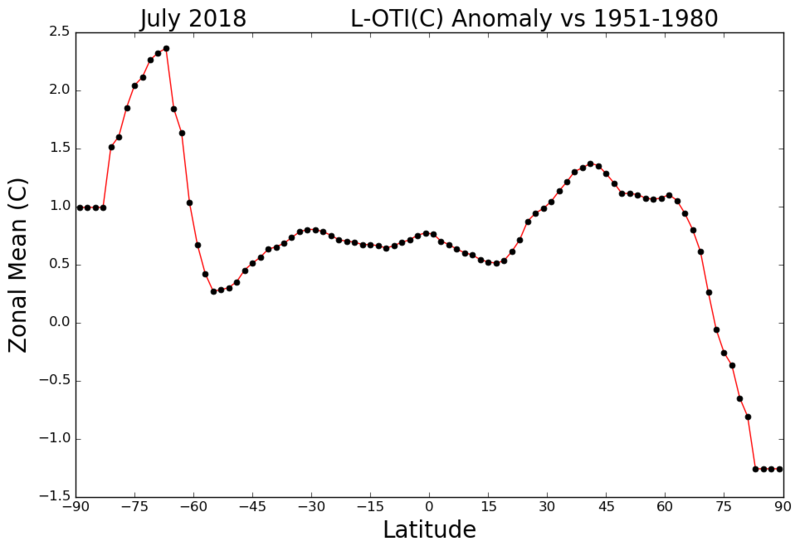 Note: Global temperature data are reported as anomalies, the measure of the amount of departure from a reference value or long-term average, or simply when the conditions depart from average conditions for a particular place at a given time of year. Let's compare global anomaly averages in zones of differing latitude. The zonal graph shows the global surface temperature anomaly trends (calculated using land-ocean temperatures) for April 2018. The zones mean the different latitudinal zones: Arctic (90.0 - 64.2°N), N. Mid-Latitudes (64.2 - 23.6°N), Tropical (between 23.5N and 23.6°S), S. Mid-Latitudes (23.6 - 64.2°S), and Antarctic (64.2 - 90.0°S). Trends: Temperature change (°C) of a specified mean period over a specified time interval based on local linear trends. Mean period: Any monthly, seasonal (3 months or 6 months) or annual mean. The period is declared missing unless >50% of data are available. Time interval: Years over which temperatures are averaged or trends are found. Describe the appearance of the July 2018 Zonal Mean vs. Latitude graph? Based on the observed graph, what areas exhibit the most warming and cooling? What do you think causes these changes? What questions come to mind that you would like to research? What datasets would you request to review to support these questions? Get the Zonal Mean Data here.